East Timor Legal News Source: Global Voices Posted 9 August 2012 18:10 GMT Written byJanet Gunter - On Monday, Tempo Semanal newspaper leaked the proposed cabinet of the new coalition government in East Timor, which included Maria Domingas Alves (known as Mikato) as Minister of Defense and Security, the highest civilian position presiding over the armed forces. Fundasaun Mahein and news sources reported Tuesday that new President Taur Matan Ruak, himself long-time leader of the guerrilla resistance and then the independent nation's armed forces, has shown his objection to the nomination. Behind the scenes, it appears, negotiations led to the naming of Cirilo Jose Christopher in her place. Mikato is one of East Timor's highest-profile women in politics, having presided over the Ministry of Solidarity and Social Services, during an extended crisis of internal displacement, the launch of an old-age pension and aid to veterans. Because of this we of the women's movement in Timor Leste manifest our discontent with [the President's] words which reduce the dignity of East Timorese women, and ignore women's capacity that was well demonstrated [by Mikato] in her over five years contributing strong successes in the administration of the first coalition government. The Women's Group of Parliament spokeswoman told the media [tet] that this episode “kills the spirit of participation among women”. University of Timor Leste professor Matias Guilherme was interviewed by Timor Post on the issue (published [tet] on Timor Lorosae Nacao blog) - Nia informa, agora ne’e presiza maka kapasidade da lideransa, la presiza nia tenki mai husi militar, Background militar maibe nia labele jere ou administra instituisaun Defesa no seguransa, ida ne’e mos sai kestaun bot ida. He informs that what is needed now is leadership, there is no need for a military background. [Somebody] with a military background with no ability to manage or administer Defense and Security, that would be a much bigger issue. Since the days of Muki Bonaparte, a founding member of East Timor's major party proposing independence, women have played a visible role in politics and national life. Rede Feto writes - Partidu Politiku rasik loke sira nia odomatan atu feto sira bele involve no organiza sira nia atividade. Organizasaun OPMT (Organizasaun Popular das Mulheres de Timor) hanesan organizasaun feto ida ne’ebe hahu sira nia atividade iha fulan Agostu 1975. […] Comite Central Fretelin (CCF) mos fo fiar ba feto ida hanaran Rosa Bonaparte Soares/Muky atu bele lidera organizasaun ida nee. The political parties themselves opened the door for women to enter and organise their own activities. The organisation OPMT (Popular Organization of Timorese Women) was a women's organisation that started its activities in August 1975. 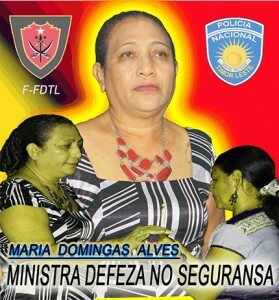 The Central Committee of Fretilin (CCF) trusted one woman named Rosa Bonaparte Soares/Muky to lead this organisation. Even after her martyrdom on Dili's docks with Isabel Bareto Lobato and Silvina Namuk on the Indonesian invasion in 1975, women continued to play an important role in East Timor's resistance, in all of its forms armed, clandestine and diplomatic. Clandestine activist women like Maria Goreti paid the ultimate price. Other women like Mana Bisoi (Pt) fought in the armed resistance and continue to represent women in public life. Australian researcher Sarah Niner wrote earlier this year on her blog - The women who fought accepted that the struggle for women’s rights was not possible during the fight for independence. However, the struggle for independence created a pool of highly skilled and motivated women who no longer accepted the status quo and today work toward equity for women. In governments since independence, women have held key ministries, such as the Ministry of Finance and Ministry of Justice. East Timor's constituent assembly and first governments had relatively high levels of representation of women, with near 30% of parliament as women in the last parliament. This parliament has even more, with 35% women, according to the blog Forum Feto Global. But are numbers indicative of real representation? Susan Marx wrote prior to Timorese elections this year on Asia Foundation's blog - […] Timorese women are questioning the practicalities of participating within a historically patriarchal society. What was interesting in our research was that many of the women currently active in politics were adamant in demanding more meaningful participation. They cite the lack of women in leadership roles and decision-making positions as evidence that political parties use women’s participation only in an attempt to placate critics and to satisfy the quota requirements. Other potential candidates cited the lack of regard for women’s views within the political fray as one of the main deterrents from becoming involved themselves. The controversy over Mikato certainly raises the question of whether Timorese male leaders perceive certain roles to be male-only in nature. Niner asserted in March - […] ongoing conflict, and an aggressive political culture, favours a type of strong, militarised masculinity that marginalises women, placing them in less visible ‘traditional’ roles, and has a negative effect on their status and political participation. Timorese women movement does not agree with President TMR’s declaration Radio Televizaun de Timor-Leste August 9, 2012- The Timorese women's movement does not agree with President of the Republic Taur Matan Ruak’s declaration publicised in the newspapers stating that Ms. Maria Domingas Alves has no capability to assume the post of Minister of Defence and Security in the country. The women's movement believes that Ms. Alves has the capability to take part in the process of development in Timor-Leste. Executive director of Rede Feto Jasinta Lusina said she did not agree with the President’s declaration in the newspapers. “The statement of president of the republic has systematically shown that he has discriminated against women’s rights to participate in the development process,” she said. Lusina added that the president’s declaration has breach the constitution article 16, 17 and 63 that entrenches gender equality and every person of the country have right to take a part in the development.